Leighton Buzzard played host to a very special visitor yesterday when Her Royal Highness, The Princess Royal, toured the offices of the town’s Citizens Advice service in Bossard House. The princess, who is Patron of the National Association of Citizens Advice Bureaux, met many of the charity’s staff and volunteers to learn about their work and the client issues they see in the town. The Princess also chatted to former manager, Barbara Brown, who was involved in setting up the Citizens Advice service in Leighton-Linslade in 1975, to understand how the local service has changed during its 43-year history. Last year Citizens Advice Leighton Linslade helped over 2,500 local people with more than 10,200 different problems. The branch has a dedicated team of 47 highly-trained volunteers and six staff to help clients with issues ranging from debt, housing and employment problems, to relationship breakdown and consumer issues. The timing of Her Royal Highness’ visit was of special significance to the team, as it coincides with the 80th birthday of the national Citizens Advice service this year. Eryl Hardman, chairman of trustees of Citizens Advice Leighton Linslade, said: “We are honoured that Her Royal Highness took the time to meet our team of committed volunteers and staff. Her Royal Highness was welcomed to Leighton Buzzard by HM Lord Lieutenant of Bedfordshire, Helen Nellis, and her Lord-Lieutenant Cadets, Corporal Alissa Morgan from St John Ambulance and Cadet Sergeant Élodie Pierlot from Flitwick and Ampthill Sea Cadets. Speaking after the visit, the Lord-Lieutenant said: “It was a great pleasure to welcome Her Royal Highness The Princess Royal to Bedfordshire to tour the facilities at Citizens Advice Leighton-Linslade. > History: Leighton-Linslade and District Citizens Advice Bureau was founded in 1975 after a public meeting was held to establish the need for a bureau in the town. One of the original steering committee members, Barbara Brown, later became manager of the bureau in 1989 and her tenure lasted until 2008. Originally based in Leighton Road, in 1989 the bureau moved to Bossard House, where it has been located ever since. David Wood took over as manager in 2008 and retired in 2017. The Bureau changed its name to Citizens Advice Leighton-Linslade in 2015 as part of a national Citizens Advice re-brand. 39% of those queries related to benefits, with disability benefits being the key area. 19% of those queries related to debt, with Council Tax arrears being the most common issue. In the same year, 35% of Citizens Advice Leighton-Linslade clients reported having a disability or long-term health condition, which reflects the amount of work they undertake on disability benefit issues. > The team. 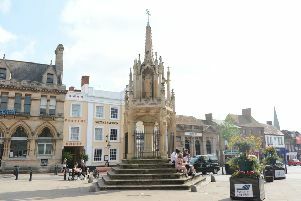 Currently, Citizens Advice Leighton Linslade has 47 volunteers, of whom 45 are advisers, plus other volunteer roles such as a book-keeper and receptionist. Some advisers have taken on specialist form-filling roles, helping with research and campaigns, and outreach.